and a fox called Frank. 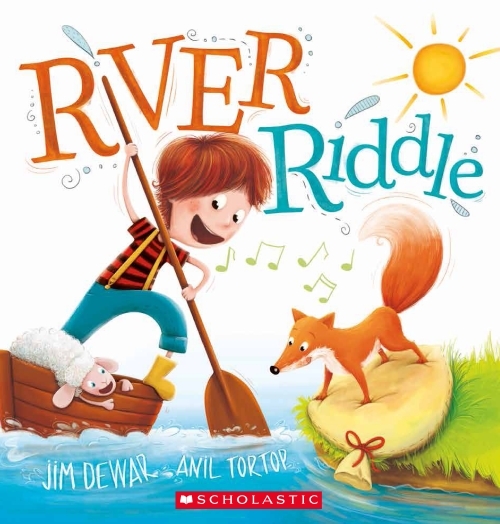 River Riddle presents the well-known river crossing conundrum as a picture book. Jack is travelling to market with a bag of hay, a sheep and a fox. The market is on the far side of the river, and the only boat available is too small to take everything/one. If he leaves the sheep and the hay together or the fox and the sheep, the consequences will be dire. Jack is clever though and devises a solution. The story is told in rhyme and asks questions of the reader. Illustrations show Jack’s imaginings in thought bubbles as he plans how he will get everyone across to market. Illustrations are digital and full of colour and fun. This is an age old puzzle and quite tricky, particularly in the age of NOW, when everything seems to be available so quickly and readily. Jack thinks about his problem, and draws out potential solutions with a stick in the soil. Readers can try to work it out themselves, with the clues provided. Younger children will enjoy the rhythm and rhyme and the expressions on the faces of the animals as they are thwarted. Great fun, recommended for pre- and up to mid-primary puzzlers.